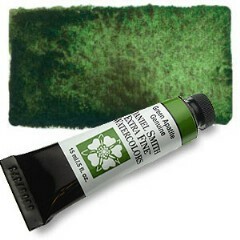 Green Apatite Genuine Watercolour lets you create a beautiful range of greens-fresh yellow-green to deep olive, from a single tube. This sedimentary colour is a dark, almost brown, olive green in mass tone. In washes, the brown settles out of a vivid natural green, creating memorable texture and contrast.